BRT Fire and Rescue Suppliers recommend to you the best selection of Akron Brass Eductors that best suits your industrial or marine fire fighting foam application. Akron Brass Company manufacture marine and Industrial eductors using only high quality "red' brass. High in copper, red brass stands up to highly corrosive salt water and recycled industrial water. It is critical when purchasing this type of equipment to ensure it is properly matched to th ecorrect nozzle and the hose layouts. 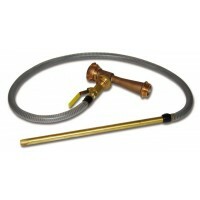 BRT Fire and Rescue Supplies is an authosied distributor of Akron Brass Company in based in Queensland, Australia.